I’ve had a few questions about what options there were for scales and sounds on dominant 7th chords so I decided to make a lesson demonstrating a few of the common ones and talking a bit about what I think characterizes them and how I approach improvising with them. I set out to just make a few short examples, but in the end I talk a bit about how I use the scales and about the lines so the video became a bit long. In the end I thought the information was useful so I left it in there. As I mention in the video I often uses the chords when learning scales so if I want to learn to improvize with a certain scale at some point in a progression or song then I find a chord that really sounds like that scale and play that in the context of the song to hear how it sounds. In this example I am “just” using the Bb Major scale. It seems logical as a starting point and as a reference. I did try to make a melody on the F7 that was at least not cliché. I do that by using Drop2 or Open voiced triads, something that might be a subject for a later lesson too as they are a very good way to incorporate larger intervals in lines without sounding too fragmented. In this example we borrowed the dominant of Bb minor in the cadence. It works well with a lot of different chord types to borrow an equivalent from the minor scale. Mixolydian b9b13 is also more or less the first choice for a scale on an F7 that resolves to a minor chord, so for that it is important to know it. I chose the F7(b9) chord as an example because it has a 5th and a b9 which in context gives paints the F7 from Bb harmonic minor sound (to me anyway). Part of the line on the F7 is based on the A diminished arpeggio which is also diatonic to Bb Harm min. 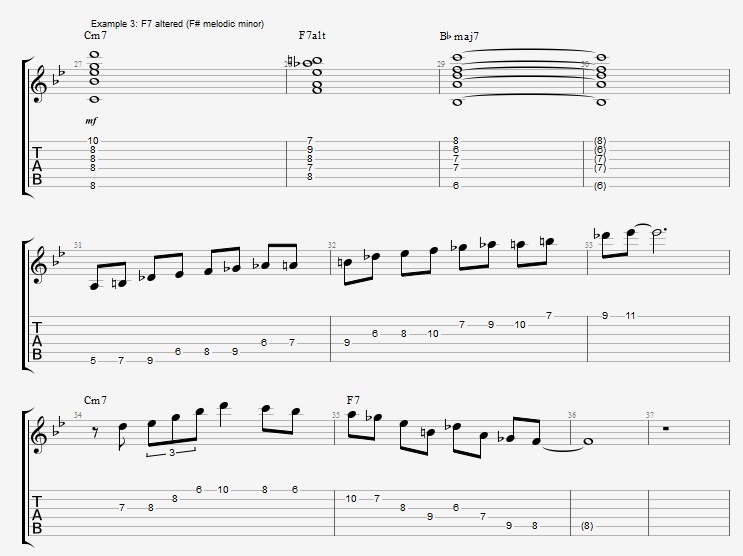 and is a good arpeggio to check out when using that scale. 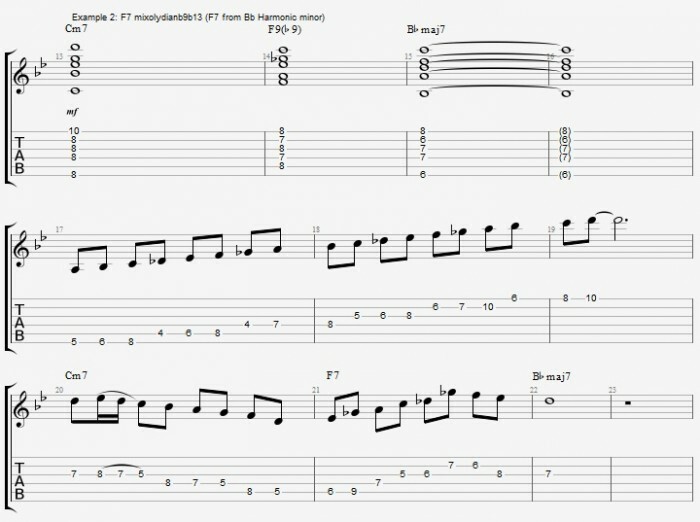 Playing F# melodic minor is on an F7 chord is mostly described as the F7 altered scale. The melodic minor scale has a strong augmented sound in it and the scale also sounds a bit like the whole tone scale as I demonstrate in the video. 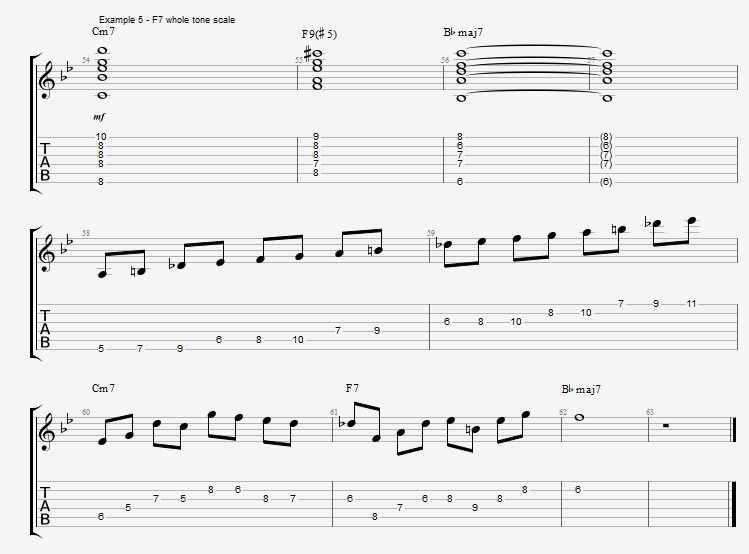 Making lines on F7altered I find it a good starting point to use the fact that F# melodic minor also contains the B7 which is the tri-tone substitute of F7. 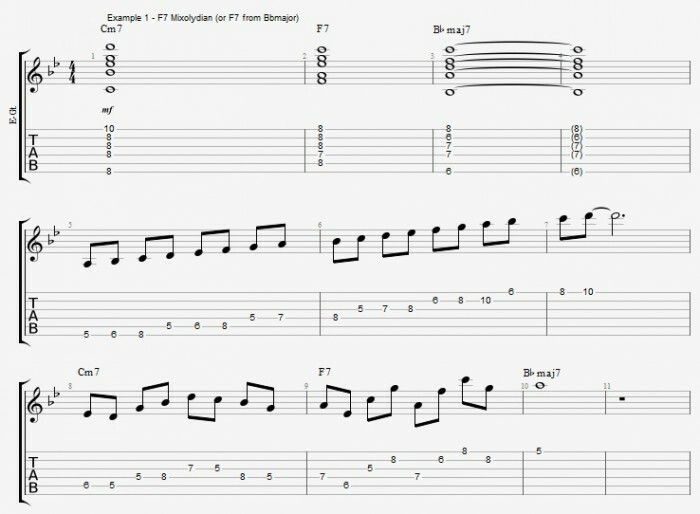 As an example I use the B7 and F#m triad arpeggios in the line. If it is difficult to hear the F7 altered then it can be good to really just play/think B7#11 and resolve that to Bbmaj7 to get used to the sound. The diminished scale is another good scale to apply to dominants. It is to me charactereized by the fact that it has alterations on the 9(which to me sounds minor), but has a natural 13 (which sounds like major), which is why it has some things sounding like minor and some like major. This mix of minor and major extensions makes it a bit difficult to use in some situations. One important aspect of the diminished scale is that it is symmetrical, so everything can be transposed in minor 3rds and still be in the same scale. 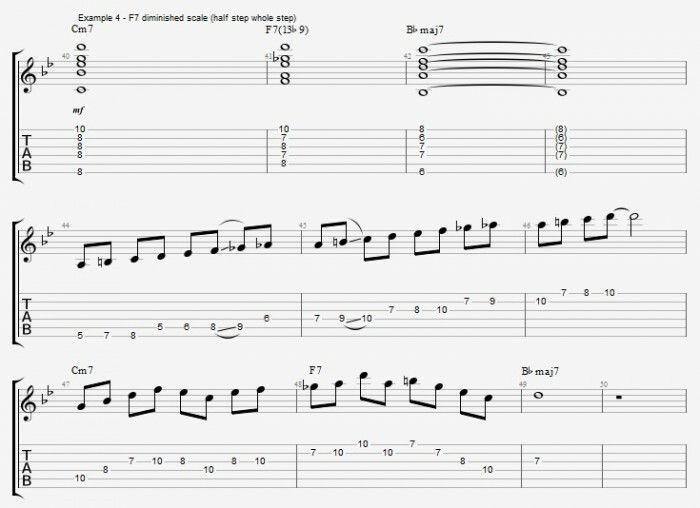 This is handy in terms of guitar technique because it is easy to move a phrase like that on the guitar, but often the phrases you get when you make melodies like that are very predictable and (to me) not very beautiful. The way I mostly approach making melodies with the dimninished scale is to mix up the triads that it contains, for the F7(13b9) chord there are 4 major triads contained in the scale: F Ab B and D, so I mix those up to make lines, of course there are many other ways to make lines, this just happens to be what I mostly do (right now anyway). The Whole tone scale was until now a bit of a special effects scale to me. But as has happened before, when I make a lesson on something I get to rediscover shings. In a way the Whole tone scale is the opposite of the diminished scale because it has a natural 9 and altered 5th or 13. Since it is a scale consisiting only of Whole steps there are not that many options for chords, everything is augmennted triads and dominants, so that is what you have to work with when making lines. As I also mention in the video I sometimes use the wholetone scale as an effect in situations where the chord contains an augemented triad, in a way letting the triad decide what Whole tone scale to use even if that does not fit with the rest of the chord. As an example a AmMaj7 where the chord contains the Triad C E G# so you could play C D E F# G# Bb on it, a similar trick could Work on a D7(9#11)). This entry was posted in Blog, Lesson and tagged advanced, altered scale, arpeggio, arpeggios, chord voicings, chords, composition, diatonic, Diminsihed scale, Dom 7th, Dominant 7th, Fractal, guitar, Guitars, harmony, improvisation, jazz, Jens Larsen, lesson, melodic minor, online, practice method, Scales, Theory, triad, Video Lesson, Whole tone scale, YouTube on July 30, 2014 by jens.